Vivian Mary Hartley was born on this day in Darjeeling, Bengal, India in 1913. Today is the 99th anniversary of her birth. She made her stage debut reciting “little bo peep” at age three. After seeing O’Sullivan in a movie she enrolled in the Royal Academy of Dramatic Arts. She left the school when she married Herbert Leigh Holman. She made her first film, Things Are Looking Up in 1935. At the advice of her agent she changed her professional name to Vivien (changing the “a” to an “e”) Leigh. In 1937 she co-starred with Laurence Olivier in Fire Over England and the two began an affair. When Olivier went to Hollywood to film Wuthering Heights she followed. She wanted the role of Scarlett O’Hara in Gone With The Wind. The couple went to the set to see the Burning of Atlanta scene, and she was introduced to the producer, David O. Selznick. He got her a screen test, and she got the role. She won an Academy Award for her Scarlett. In 1940 she divorced Leigh Holman and married Olivier. The two became a Hollywood “Powerhouse couple” [Ibid] They starred in several films and plays together. But Leigh suffered from manic depression / bipolar disorder. She had a miscarriage in 1944. 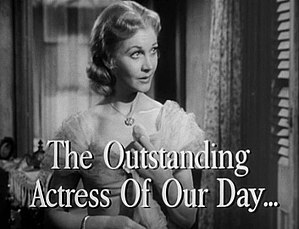 In 1949 she took up the second great role of her life, Blanche Du Bois in A Streetcar Named Desire. She brought life to the role, first on stage and then on film. She won her second Best Actress Oscar for Streetcar. At home things were crumbling and she and Olivier divorced in 1960. She bounced back with her Tony Award winning role in Tovarich in 1963, and starring in the Oscar-winning Ship of Fools. But she became ill again in 1967 while in London and passed away from tuberculosis at the age of 53. This entry was posted on Tuesday, November 6th, 2012 at 4:24 am	and posted in Broadway, England, Film, postaday, Thought of the Day, Today's Birthday, Vivien Leigh. You can follow any responses to this entry through the RSS 2.0 feed.